In May 1998, the Queen welcomed Emperor Akihito and Empress Michiko for the Japanese imperial couple's state visit to the United Kingdom. Shown above is the banquet at Buckingham Palace, featuring the Queen in a gold embellished gown and a festival of diamonds: Queen Alexandra's Kokoshnik Tiara, the Coronation Necklace and Earrings, and the True Lover's Knot Brooch (plus a diamond bracelet and diamond evening watch). She is also wearing both of her family orders and the Order of the Chrysanthemum from Japan (red and blue sash with badge at the hip, plus the star). The Emperor is wearing the Order of the Garter, which was bestowed upon him during this visit. 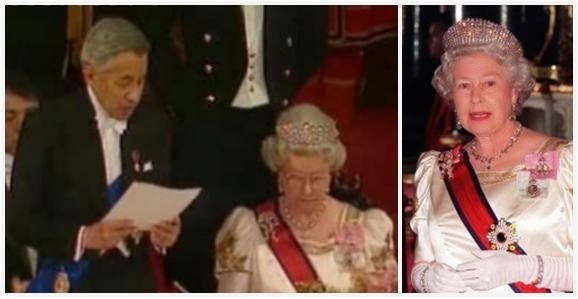 You can click here for a video on the controversial visit, and count other tiaras (including the Greville Tiara on the Queen Mother) while delighting in the huge sparkle of this kokoshnik tiara. In current news... Church at Wolferton was on Sunday's agenda, and the Pearl Trefoil Brooch was out for show.